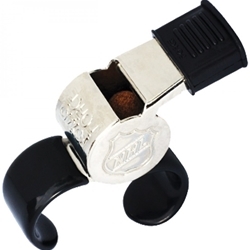 The official whistle of the NHL. Technically superior to other pea-style metal whistles! Developed for Ice Hockey, but adopted in to other sports, the SuperForce CMG Fingergrip is a technically superior silver metal whistle with with powerful lower tone and moisture-resistant sound ball. Lead-free. Available in silver only.